Titles include NYX #1, Spectacular Spider-Man #5, Venom #5, Weapon X #13, The Punisher #33, Avengers #71, Iron Man #73, Paradise X: X and Incredible Hulk #62. For covers and four-page previews of DC Comics titles arriving in stores on Wednesday, CLICK HERE. Titles include JLA #88, Batman: Death and the Maidens #3, The Demon: Driven Out #2, Adventures of Superman #621, H-E-R-O #9, JSA: All-Stars #6, 100 Bullets #47, Fables #19, World's Best Comics: The Golden Age DC Comics Archive Sampler and Tokyo Storm Warning #3. Titles include Sword of Dracula #1, Feather #2, The Agents #6 and Frankenstein Mobster #0. Marvel Comics on Wednesday released a double-page spread from Amazing Spider-Man #500 by John Romita Jr. and Scott Hanna. (Click on the image above for a larger look). "Amazing Spider-Man #500 finds Peter Parker spending his birthday as Spider-Man battling an inter-dimensional threat that descends on Manhattan. 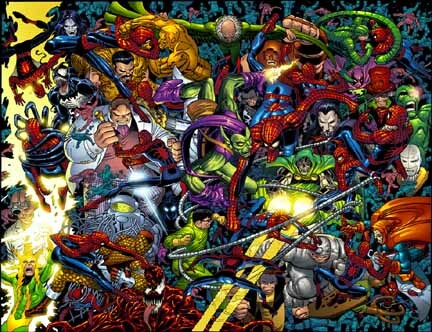 Fighting alongside Spidey is a who's who of Marvel Universe guest-stars, including the Fantastic Four, Thor, Iron Man, the X-Men's Cyclops and Dr. Strange. The battle culminates in a trip through time, where Peter/Spider-Man meets ALL of his greatest adversaries like Doctor Octopus and the Green Goblin, and has one very special and unexpected reunion drawn by none other than John Romita Sr. himself." Amazing Spider-Man #500 will be 48 pages, will cost $3.50 and will go on sale on Oct. 22. Dreamwave Productions has declared January Transformers Month, with Transformers Armada #18 leadning into a new title with Transformers Energon #19. "Energon the chapter will set one of the most memorable battles of 'good versus evil' ever, when it is brought to a whole new level with a very extraordinary twist. Prepare yourself as the Autobots and Decepticons revamp themselves into newer, bigger and more powerful alternate modes never seen before. Together, the bots will grow, and we mean GROW! to embark in one of their most important wars yet! Watch out when the great and mighty Unicron is revisited and as we bring back some of the old school big-timers such as Scorponok, Battle Ravage and Energon Inferno. With writer Simon Furman and the return of penciller Guido Guidi, it's bound to be all it promises to be." Furman, Transformers veteran of 18 years, said: "The 'World's Collide' storyline (Transformers: Armada #14-17) and the subsequent showdown with Unicron have generated a real pace and excitement -- and that's just in me! -- that's going to translate to a steaming start to Transformers Energon. It also helps coming in at the very start of something, knowing that you'll be laying the groundwork for the (comics) continuity. I'll do my best to see it lives up to your -- and my own -- high expectations!" "We're really looking to take all of our Transformers titles to the next level," explained Dreamwave creative director James McDonough. "And Transformers Energon is no exception, allowing us to take the popular characters and concepts of Transformers Armadad even further." To the right is a new Mutant X promotional image featuring Victoria Pratt as Shalima Fox. Click on the thumbnail for a larger and fuller image, and for a thorough plot synposis, complete with spoilers and details of what happened to such characters as Emma and Adam, as well as how Lexa is introduced, CLICK HERE. "Ghost of a Chance," a new episode of X-Men: Evolution, is scheduled to air on Kids' WB! on Saturday, Oct. 11. Coming Friday: Movie news -- and much more!! !